Alicia Vikander is 27 years old and over the course of 2 years has cemented herself as one of the best actresses in the business. With roles in period pieces Anna Karenina & Testament of Youth, toss-away movies Son of a Gun & Seventh Son, enjoyable films U.N.C.L.E. & Burnt, a Golden Globe nominated performance in Ex Machina, an Academy Award winning performance in The Danish Girl, and upcoming projects Tulip Fever, Jason Bourne, The Light Between Oceans, & Submergence, she must literally never sleep. And then there are her “old” movies, Swedish & Danish films she did a couple years back which also happen to be incredibly strong: Pure & A Royal Affair. Vikander is an actress like none we have ever seen before, a dynamic young talent who has reached veteran status with ease and who seems to only be speeding up. In 1767, during the Age of Enlightenment in Europe, Denmark still clung to its traditional ways, the monarchy continuing absolute rule over the country & its peasants. The King, Christian VII, would marry the Princess of Britain, Caroline Mathilde, uniting the nations and establishing a strong royal line. But Christian was troubled, prone to juvenile rages, drunken carousing, and strange melancholy spells. His Court decreed that he must have a personal physician, Christian choosing German Johann Struensee, a man who quickly became his best & only friend. But Struensee was both a radical of the Enlightenment and in love with Queen Caroline, a deadly combination that would set Denmark on fire. 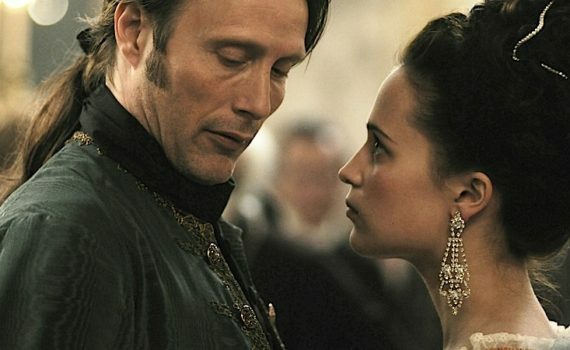 A Royal Affair is a historical drama that stays very true to actual events; the arranged marriage, the affair, Denmark’s progressive period, its return to an iron-fisted regime. The story is extremely interesting and makes the movie much more than a simple period piece, becoming a important film rather than a typical costume drama. It was actually nominated for Best Foreign Language Film in 2013, a well-deserved honor. Vikander was, of course, amazing in her role, playing the Queen with equal parts fear & courage. Mads Mikkelson (Casino Royale, Valhalla Rising, The Salvation) was the perfect flawed hero, an anti-Hollywood leading man. And the King was expertly portrayed, mad & childish, pathetic & frustrating. Subtitled and not short, this isn’t your standard American, big-budget, Keira Knightley, novel-turned-film period piece, but rather something much better.